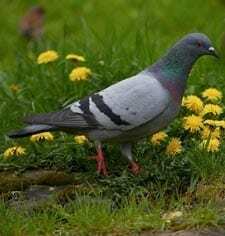 A common sight in cities around the world, Rock Pigeons crowd streets and public squares, living on discarded food and offerings of birdseed. In addition to the typical blue-gray bird with two dark wingbars, you’ll often see flocks with plain, spotted, pale, or rusty-red birds in them. Introduced to North America from Europe in the early 1600s, city pigeons nest on buildings and window ledges. In the countryside they also nest on barns and grain towers, under bridges, and on natural cliffs.